Based on recent statistics, we are losing World War II veterans at the rate of approximately 372 per day. This means there are approximately only 496,777 veterans remaining (as of 2018) of the 16 million who served our nation in World War II. Honor Flight Austin will continue to do whatever it takes to fulfill the dreams of our veterans and help our heroes travel absolutely free to visit their Memorial. Honor Flight Austin is accepting applications from any WWII Veteran living in the State of Texas and we are also accepting applications from our heroes who served in-country during the Korean and Viet Nam Wars. They, too, have given so much and it’s time we show them that their efforts are not forgotten. Please check for any announcements or updates on our Honor Flight Austin website and Facebook page. The Honor Flight Austin mission is to transport with a specific priority given to WWII Veterans in the State of Texas and Korean and Viet Nam War Veterans residing within 14 counties listed below to Washington, D.C. to visit those memorials dedicated to honor their service and sacrifices and return them home to their families and loved ones. Honor Flight serves the following counties: Bastrop, Bell, Blanco, Burnet, Caldwell, Fayette, Gillespie, Gonzales, Hays, Lee, Llano, Milam, Travis, and Williamson. Honor Flight Austin, a 501(c)(3) nonprofit organization, knows that our veteran heroes aren’t asking for recognition. It is our position that they deserve it. Our program is just a small token of our appreciation for those that gave so much. All members of Honor Flight Austin are volunteers; 97% of your contributions go toward their flight to Washington, D.C. Please help us continue to make their dream of visiting THEIR memorial, a reality. HONOR FLIGHT AUSTIN — our way of saying to all our veterans — one more TOUR with HONOR. All donations are tax-deductible. 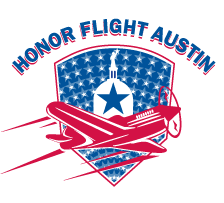 For more information on Honor Flight Austin and our flights for Veterans, fill out our form on the Contact page.